What makes linear logic linear? This entry was posted in Logic on January 30, 2008 by markcc. Godspeed You! Black Emperor, “Antennas to Heaven”: What can you really say about the greatest post-rock ensemble ever? The Windmill, “Please Keep War Stories to a Minimum”: a recent post-rock discovery of mine, via bitmunk. Excellent group. Rachel’s, “An Evening of Long Goodbyes”: Rachel’s is one of the more classical-leaning post-rock groups. They’re wonderful. Peter Schickele, “Listen Here, Tyrannosaurus Rex”: The discoverer of PDQ Bach, actually doing something really goofy in his own name. Fun, but silly. what seems like a simple little ballad, but the chorus involves a bunch of wonderfully strange chords and time changes. Just brilliant. roughly speaking, the Mogwai vein. Another really great group – The Redneck Manifesto is one of my favorites. Marillion, “Toxic”: a live version of Marillion covering a Britney Spears song. Who knew that a Britney tune could be anything other than total trash? Still not exactly a brilliant piece of music, but it’s not garbage, either. band. They’re sort of vaguely like early Fairport Convention, but with a very modern instrumental sound. I first heard these guys on New York’s NPR station. They’re really good. Mogwai, “I know you are but what am I?”: Mogwai – among the best post-rock out there. Not enough good things that I can say about them. This track is an ethereal wonder. originally band leader found religion and quit. I know a lot of SB fans dislike this album, and particularly dislike this song, but I really don’t know why. It’s the first SB song I heard, and I still think it’s terrific – better than a lot of the older Morse-written stuff. This entry was posted in Music on January 25, 2008 by markcc. Today’s entry is short, but sweet. I wanted to write something longer, but I’m very busy at work, so this is what you get. I think it’s worth posting despite its brevity. claim that group theory defines symmetry, that’s not really entirely true. My favorite example of this is the fifteen puzzle. space into the empty. In the puzzle, you scramble up the tiles, and then try to move them back so that they’re in numerical order. The puzzle, in its initial configuration, is shown to the right. 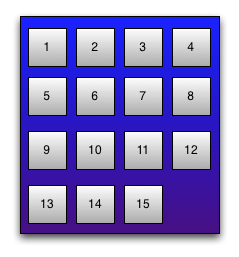 If you look at the 15 puzzle in terms of configurations – that is, assignments of the pieces to different positions in the grid – so that each member of the group describes a single tile-move in a configuration, you can see some very clear symmetries. For example, the moves that are possible when the empty is in any corner are equivalent to the moves that are possible when the empty is in any other corner. The possible moves when the space is in any given position are the same except for the labeling of the tiles around them. There’s definitely a kind of symmetry there. There are also loops – sequences of moves which end in exactly the same state as the one in which they began. Those are clearly symmetries. But it’s not a group. In a group, the group operation most be total – given any pair of values x and y in the group, it must be possible to combine x and y via x+y. But with the 15 puzzle, there moves that can’t be combined with other moves. If x = “move the ‘3’ tile from square 2 to square 6”, and y = “move the ‘7’ tile from square 10 to square 11”, then there’s no meaningful value for “x+y”; the two moves can’t be combined. This entry was posted in Category Theory, Group Theory on January 24, 2008 by markcc. presentation of group theory. I did a whole series of articles about category theory right after I moved GM/BM to ScienceBlogs; if you want to read more about category theory than this brief introduction, you can look at the category theory archives. theory makes the idea of mappings between things as the fundamental abstraction. This entry was posted in Category Theory, Group Theory on January 20, 2008 by markcc. than pretty much anything made of beef. flavor of a really fresh fish comes through. a chinese grocery; American grocery stores often have fish that’s been sitting on ice for a long time. Chinese shoppers are, properly, very picky about their fish, so you tend to get it much fresher from a chinese grocery. This entry was posted in Recipes on January 18, 2008 by markcc. Mogwai, “I Chose Horses”. Mellowness from one of the greatest Post-Rock groups around. I listen to. I don’t know quite how to describe it. Often atonal, seriously dissonant when not outright atonal, oddly structured. It’s very peculiar stuff, definitely not to everyone’s taste. Gordian Knot, “Singularity”. A very hard/loud instrumental piece. Definitely in the prog genre. Beautiful guitar solos, great bass pulse driving it. Naftule’s Dream, “The Wanderer”. Would you believe progressive Klezmer? King Crimson, “Neal and Jack and Me”. fact it’s really nothing more than Dave Gilmour masturbating with his guitar. Ick. missed if you get a chance to see him live! This entry was posted in Music on January 18, 2008 by markcc.